Every year, Garver shines the spotlight on approximately 20 communities that have completed quality infrastructure projects and improved their way of life. These projects are often a source of community pride, and we're excited to highlight them every quarter in our newsletter, IQ. Now that we've created a website for our newsletter, it's easier to share our clients' successes and help others find answers. 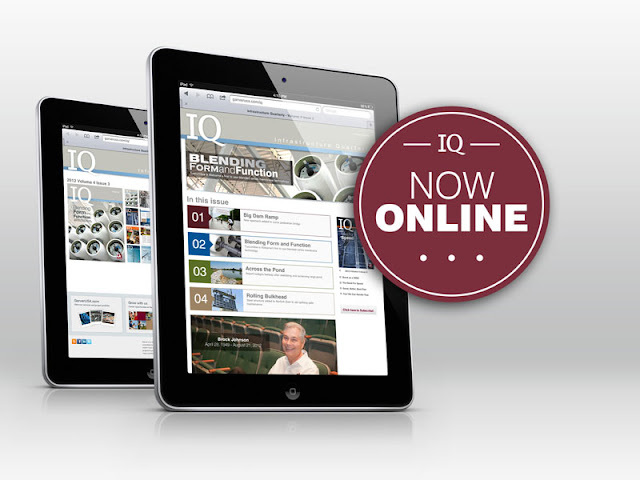 Our newest issue of IQ is now online, and the print edition will soon be in mailboxes. Take a look at the projects we've featured and dig around our site for additional information. Big Dam Ramp - New approach added to iconic pedestrian bridge: After the ribbon was cut on a steamy morning in August, a group of excited cyclists clipped into their pedals and made the inaugural climb up the Big Dam Bridge's southwest approach. Online bonus! We only had room to include one photo in the print edition, but the online version features 14! Click "open gallery" to see construction photos and the ribbon-cutting ceremony. Blending Form and Function - Tuscumbia is Alabama's first to use blended series membrane technology: A new water-softening treatment plant is using state-of-the-art technology to purify and reduce hardness in the city's raw water. Located within a residential neighborhood next to a popular park, it also was important to blend the facility's aesthetics with the surroundings. This article also features 14 pictures. Make sure to use the buttons at the bottom of the page to email your family or friends. You can also easily post the article on social media sites such as LinkedIn, Twitter, and Facebook. Across the Pond - Airport realigns taxiway after stabilizing and reclaiming large pond: Relocating Henry County Airport's taxiway would achieve the standard runway centerline-to-taxiway centerline separation. However, moving 3,400 feet of pavement farther away from the runway would also run the taxiway across a 3-acre pond. There is exclusive online content included in this article that is not available in the print edition. Read about two additional aspects of this project: protecting downstream water resources and stream mitigation. There's also a great 3-D graphic and pictures showing how the pond was stabilized and reclaimed. Rolling Bulkhead - Steel structure added to Norfork Dam to aid spillway gate maintenance: By moving a 65-ton steel structure along a monorail, staff at Norfork Dam in Baxter County, Arkansas can easily seal and dewater each of the structure's 12 spillway gates. After you're done reading the articles, you can search for other articles of interest or explore back issues.